Foreign Volunteers with YPG – Terrorists or Freedom Fighters? In January 2019, the YPG press service released a statement announcing the death of Giovanni Francesco Asperti, the first Italian to die in Syria while fighting alongside the Kurds. Asperti, 53, a geologist from Bergamo in northern Italy, had joined the militia and used the nom de guerre Hiwa Bosco. He didn’t die in combat, but rather “due to an unfortunate accident” on December 7, 2018, near Al Malikiyah (Derik in Kurdish), in northeastern Syria close to the Turkish border, and far from the frontline siege of the last Islamic State (IS) pocket near Deir ez Zor. Although he fought against IS, when he left Italy in late July 2017 he allegedly told his wife and two children that he was going to work at an oil plant in Kuwait. Of course, Asperti wasn’t the first foreigner to die in Syria fighting with the Kurds, and not even the first Italian. In 2017, Nazzareno Antonio Tassone, a Canadian of Italian origin, was killed in action near Raqqa during the decisive offensive against the stronghold of the self-proclaimed caliphate. In early 2018, the French national from Brittany Olivier Le Clainche, 40, nom de guerre Kendal Breizh, and the Spaniard Samuel Prada Leon, 25, nom de guerre Baran Galicia, were killed in Afrin by Turkish-backed militias. Despite sharing the same fate, the two had different backgrounds: Le Clainche was a longtime libertarian activist who backed independence for Brittany, while the young Prada Leon began his experience in Syria as a humanitarian worker, later undertaking military training. In the same period, the Dutchman Sjoerd Heeger, 25, nom de guerre Baran Sason, died in combat with Daesh near Deir ez Zor. All of them had joined the YPG forces in the summer of 2017. Heeger’s ideological background was much more controversial. Before going to Syria, he spent time in Donbass with Right Sector and his personal blog  suggests he was a Nazi sympathizer. This shows a broad variety of political cultures and personal motivations among those joining the armed struggle against IS in favor of the Kurdish cause. Anna Campbell, probably the most famous female fighter with the Women’s Protection Units (YPJ), was another recruit. She was an English plumber who spent time in the Calais Jungle to help migrants and was involved in the British anarchist movement. She fought with the Kurds in Deir ez Zor and was killed in Afrin during the Turkish invasion. Many other Western volunteers were also killed in action there, including Haukur Hilmarsson, 32, a well-known anarchist from Iceland, and Jake Klipsch, 36, from Indiana, who fought with other Americans including Jordan MacTaggert from Colorado (also killed in action) and the journalist Freeman Stevenson from Utah. Going back to 2016, Michael Israel, 26, from California, Anton Leschek from Germany and Ryan Lock from the UK died in combat. The significant death toll among foreigners is due to the lack of military experience, but their deployment on the frontline also showed they were more than a merely nominal presence. 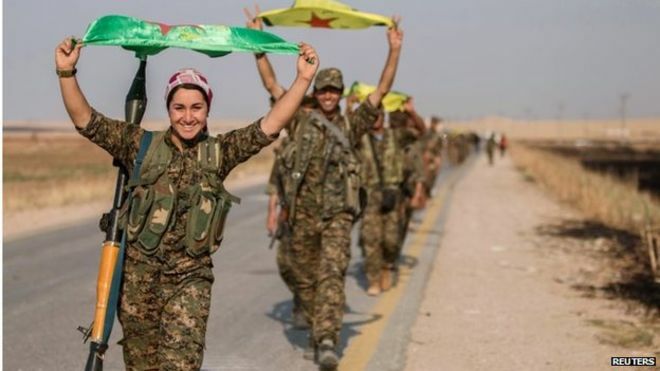 In fact, estimates suggest that several hundred Westerners have joined YPG since 2015, coming from countries including the US, Germany, Greece, Italy, France, Spain, the Netherlands, and the UK. Their historical reference is the International Brigades, set up by the Communist International to support the Popular Front during the Spanish civil war. In 2015, YPG established the International Freedom Battalion, which is predominantly made up of Marxists and anarchists from Turkey. That is why the Marxist-Leninist Communist Party of Turkey (MLKP), considered a terrorist group by the government of Ankara, was heavily involved in forming this international unit. However, European militants took part in this formation as well, such as Nantes Révoltée and Blocus Paris in France, now to some extent merged into the Yellow Vest protests. In the UK, the London Antifascists, the Manchester antifa movement, recognizable by the “161” area code logo, and the English-Irish Bob Crow Brigade, named after a trade union leader, were involved. The International Freedom Batallion also includes Spanish Marxists from Reconstrucciòn Comunista, Greek anarchists, and the Henri Krasucki Brigade from France, inspired by the Bob Crow Brigade and named after a French trade-unionist. An unusual unit of the International Batallion is the so called Queer Insurrection and Liberation Army, established by LGBT fighters with a pink flag displaying the circled A symbol of anarchism and a Kalashnikov. Their provocative motto is “These faggots kill fascists”. Another key figure in the YPG International Batallion was the Italian Karim Franceschi. He joined in 2016 after working at a hub for several leftist and antifa militants. Born in Casablanca to a Moroccan mother and an Italian father, he became well-known once back in Italy for his participation in the battle of Kobane and his activism on behalf of the Kurdish cause. He even wrote a book about his experiences in Syria. The high participation rate of anarchists certainly deserves further academic investigation. The nature and definition of anarchism play a role in determining whether the enlistment of anarchists into armed units may be considered a form of radicalization. As Professor Peter Neumann notes, anarchism was classified by the American historian David Rapoport as the first of four terrorist waves in history: anarchist, anti-colonial, new-left and religious . Seemingly, those who take action and put revolutionary theory into practice abroad might be labelled as radicalized. What many analysts agree on is the categorization of foreign volunteers into three main groups. The first is made up of leftist and anarchist militants who joined the struggle in the name of international solidarity. This is probably the largest stream of foreigners, including all the antifa networks and libertarian activists, such as the French, German and British groups, and the environmental activists, such as the Italian anti-infrastructure movement NoTAV, based in Turin. The second group consists of pro-independence militants from across Europe, such as the Breton separatist Olivier Le Clainche from France and his Italian friend Pierluigi Caria from Sardinia, who calls for the secession of the island from Italy. Caria was identified in Syria displaying the regional flag together with the Breton flag and is now being investigated by the Italian police. Other volunteers come from other restive regions of Europe, such as Catalonia and the Basque Country in Spain and Northern Ireland. In many cases, though not always, their ideology merges with Kurdish objectives. The third push factor is the defense of the West against jihadism. This is the main reason far-right militants join the Kurdish forces. The Dutch volunteer Sjoerd Heeger, mentioned earlier, is one example. The case of the former Italian soldier Alex Pineschi, 33, is different: he served in the Alpini brigade and in 2015 joined Task Force Black of the Iraqi Peshmerga as an instructor. Pineschi participated in the offensive to liberate Mosul from Islamic State. To this heterogeneous group we can add miscellaneous individuals driven by other factors. The Canadian former model Hanna Tiger Bohman joined YPJ, the female Kurdish units, to contribute in the global struggle for women’s rights. The former London banker Macer Gifford decided to become a first responder because he felt the UK was not doing enough to help the Kurds against IS. Michael Enright, a 53-year-old British actor who starred alongside Tom Cruise and Johnny Depp, joined the YPG in 2015 after seeing the footage of US journalist James Foley being beheaded by Jihadi John. European laws are not clear and uniform on the activities of these volunteers abroad. Some forbid recruitment for terrorist purposes and individual participation in armed conflicts while others are more permissive or ambiguous. For its part, Turkey has gradually shifted its focus from IS to preventing the YPG from establishing a foothold along its border, arguing that the YPG is linked to its own insurgent group, the Kurdistan Workers’ party (PKK). The US, the EU, and Britain, by contrast, do not consider the YPG a terrorist group. The commander in chief of the Women’s Protection Units (YPJ), Nesrin Abdullah, has been hosted in the Swedish and Italian parliaments for press conferences and has appeared on Italian TV. Public opinion tends to consider those who battled IS as freedom fighters and not as terrorists. However, European counter-terrorism agencies and some prosecutors are concerned about the military expertise the foreign volunteers have obtained and fear they could use it on European soil. Nevertheless, a European policy framework in this regard does not exist yet.